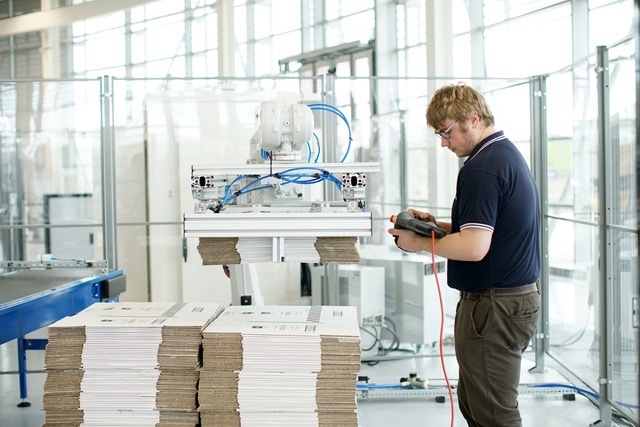 An autonomous robotic solution for improving process time and health and safety during the manufacture of cardboard boxes has been developed by the Integrated Manufacturing Group (IMG) of the Advanced Manufacturing Research Centre (AMRC). The system was developed for The Cardboard Box Company, an SME based in Accrington that designs, prints and manufactures bespoke corrugated packaging solutions for industrial, retail or promotional displays. The Cardboard Box Company were able to access the expertise and state-of-the-art capabilities at the AMRC due to a funding initiative ran by the High Value Manufacturing Catapult (HMVC). The initiative match-funds the costs involved in conducting research and development projects for SMEs. The company attended a tour of the AMRC’s Factory 2050 – home to IMG – and during the tour, those attending were told how the AMRC regularly works with SMEs through the funding initiative ran by the HMVC; so the Cardboard Box Company decided to jump at the chance to work with IMG and explore how their manufacturing operations could be improved using the latest manufacturing technologies and processes. Managing Director of The Cardboard Box Company, Ken Shackleton, said: “The AMRC came to visit us in Accrington to look at our operation and how they might improve upon any of our manufacturing processes. The company produce 22,000 cardboard boxes per hour on their machines, with operators loading and unloading cardboard bales which weigh between 15-20kg manually, an incredibly labour intensive process. To address this, IMG successfully developed a cost-effective automated system which uses a robotic arm palletising bundles of boxes. The prototype system was used to demonstrate to The Cardboard Box Company how they would be able to halve the time operators spend manually handling the cardboard materials during production. IMG Project Manager, Ben Fisher, said: “This kind of development is valuable for an SME such as The Cardboard Box Company, as it allows them to redeploy employees to production processes requiring higher skill levels and therefore a greater need of manual intervention, creating valuable efficiencies. Projects of this nature are valuable to demonstrate to SMEs the access they have to work with research institutions such as the AMRC; to develop and integrate state-of-the-art automated production processes and technologies at low-cost, on any scale. Ken Shackleton said: “This would not have been possible without the help of AMRC. For an SME to be able to access this technical level of knowledge to develop a project or resolve manufacturing issues is incredible.